A Think Pink Nail Art Look From Cherry Sue! Today I have a treat for you with a guest post by another of my favourite ladies from the Irish blogosphere. Sue describes herself as a cocktail half full kinda gal and that positivity and sense of fun really shines through in her blog. She's also incredibly talented in the nail art department, as we're about to find out. Enjoy - and when you're finished here pop on over to Cherry Sue and say hello! Oh Hai, Fluffy readers, I'm thrilled that Emma has asked me to show you a simple nail look as part of a guest post and even more thrilled that I can take the time to put something together as a nod to October being Breast Cancer Awareness month. Give yourself two coats of your base colour and allow to dry slightly. 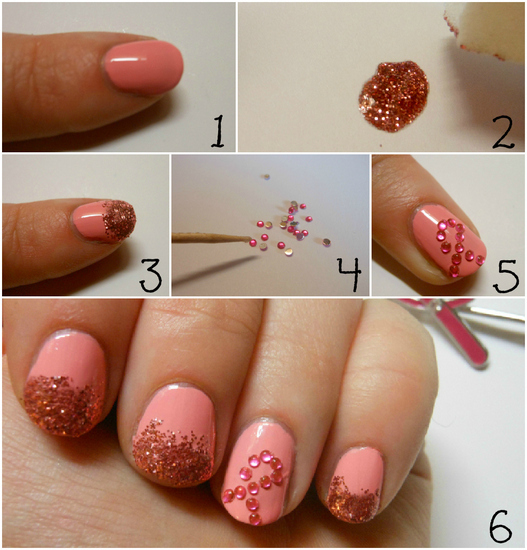 Touch the sponge into a small amount of glitter polish and begin to apply to the nail. Only cover the first quarter of the nail but don't worry about being too precise, gradient always looks better when it's a little messy. Touch the toothpick into some clear top coat use to pick up the pink diamantes. 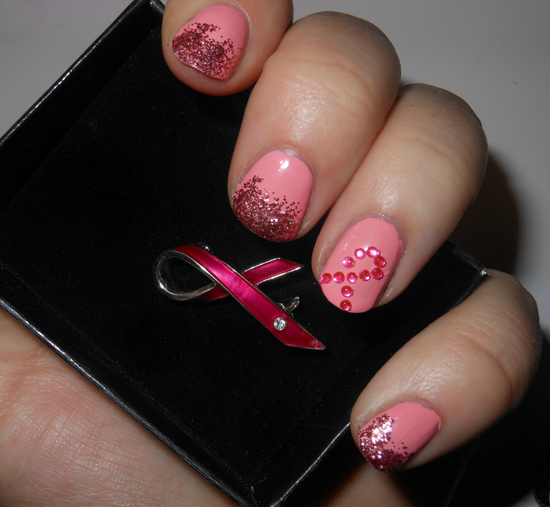 A cross starting at the tip of your nail only needs 3 diamantes on top to make the iconic ribbon. Admire your super simple handiwork and maybe even use that perfectly manicured hand to give your boobies a little squeeze, it could actually save your life, yo. What do we think? Will you be sporting a pink mani this month? By the by, that beautiful magenta brooch in the first pic is available from Avon catalogue 9 for €2.25, with 25% of proceeds going to ARC Cancer Support. Find out about the Avon Breast Cancer Promise Campaign, and how you can raise money just by making a simple promise, here. Pretty, I like it a lot! This is super pretty and a lovely way to support Breast Cancer Awareness month. This is such a cool tutorial! I adore that nails inc glitter polish, Just shows you you don't have to spend lots of money to have gorgeous looking nails. Well done Cherry Sue! Great tutorial. It turned out so well. I have been sporting pink this month. Thanks so much for the lovely comments, Ladies and of course to you Em for having me. So gorgeous! The diamante ribbon is the icing on the cake!